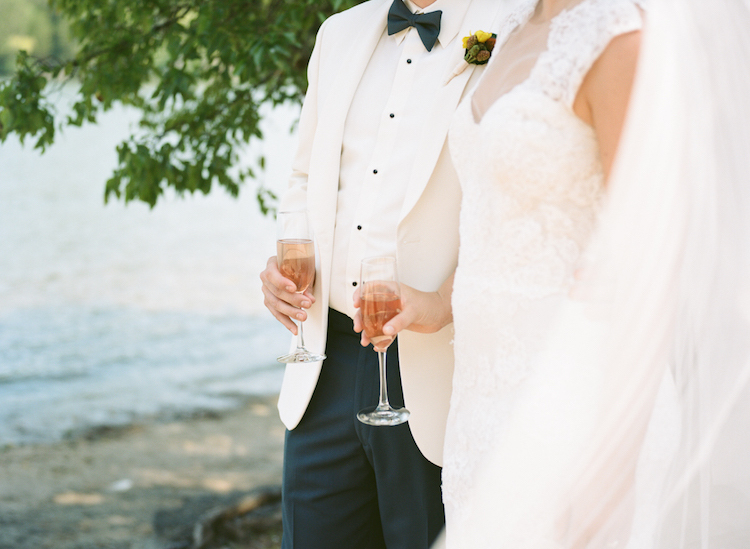 Real-life couple Katie and James met and fell in love in Nashville, Tennessee. Harking from the bay area of Wisconsin and a small town in South Carolina, respectively, the couple share a love for boating and reminisce fondly of summers spent by the lake. 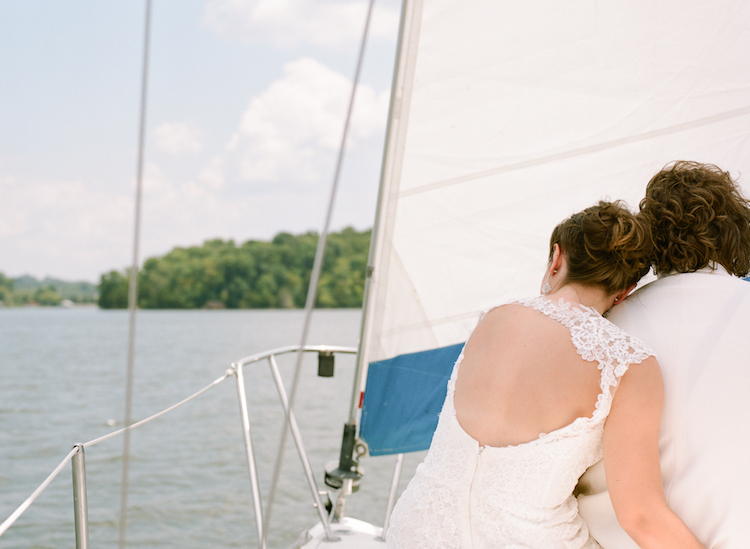 In conceptualizing our shoot, we drew upon their affinity for the lake and our own fondness of beach and destination affairs to create a more-approachable waterfront wedding in our own backyard of middle Tennessee. The beautiful early-August morning began as our bride and groom shared their first look at the dock at Harbor Island acht Club in Old Hickory, Tennessee. Katie wore Monique Lhuillier’s Harper gown (via The Bride Room) with a stunning Toni Federici two-layered Chantilly lace veil and Paris by Debra Moreland drop earrings. James was outfitted in an ivory dinner jacket with slate blue pants, a matching bow tie and suspenders, courtesy of Street Tuxedo. The betrothed made their way to the ceremony-locale island via a white sailboat. On a rocky landing overlooking the lake, the couple recited their vow as their captain officiate. An intimate brunch under the trees served as the reception. The tablescape was replete with natural and oceanic details - textured ivory linens draped over a rustic farm table, blue crystal place settings atop mother-of-pearl shell chargers, clear candlesticks of varying heights and natural wooden cross-back chairs. A small vessel of Atlantic coast sand and shells (gathered from a recent trip together) gave a nod to the couple’s affinity for the sea. Katie traded in her dramatic ceremony veil for a more relaxed post-reception sail around the island. Showing off her windswept braided updo and the gorgeous illusion neckline of her Harper gown, the newlyweds relaxed with a glass of champagne on the boat. They toasted to a happy life together as they sailed off to married bliss.